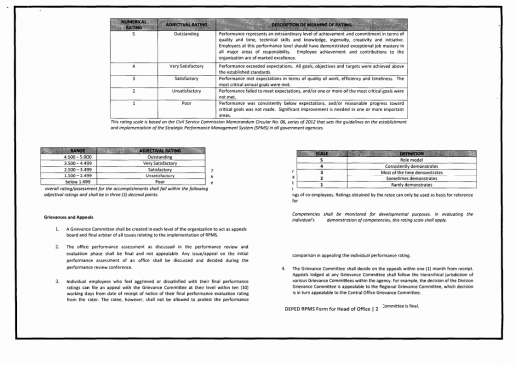 The Civil Service Commission (CSC), through the issuance of Memorandum Circular (MC) No. 06, series of 2012, sets the guidelines on the establishment and implementation of the Strategic Performance Management System (SPMS) in all government agencies. The SPMS gives emphasis to the strategic alignment of the agency’s thrusts with the day-to-day operation of the units and individual personnel within the organization. It focuses on measures of performance vis-a-vis the targeted milestones, and provides a credible and verifiable basis for assessing the organizational outcomes and the collective performance of the government employees. As a learner-centered institution, the Department of Education (DepEd) is committed to continuously improve itself to better serve the Filipino learners and the community. The adoption of the SPMS in DepEd strengthens the culture of performance and accountability in the agency, with the DepEd’s mandate, vision and mission at its core. 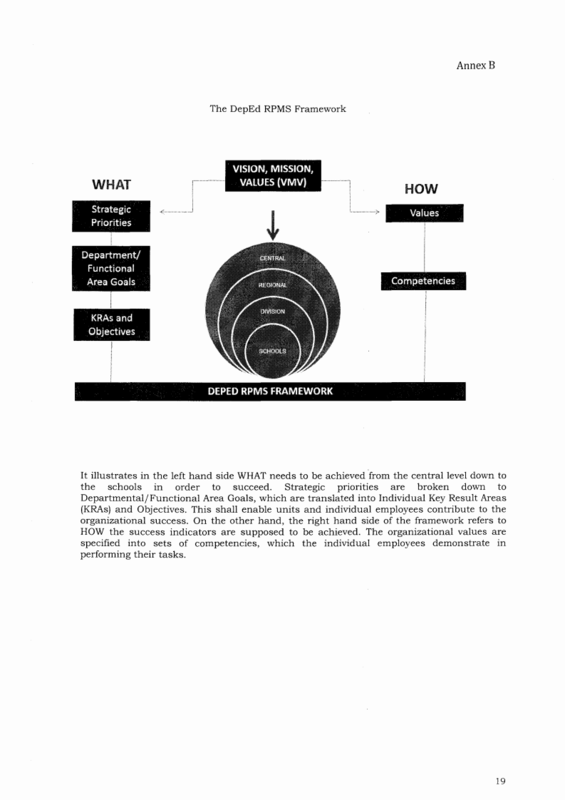 There is a need to concretize the linkage between the organizational thrusts and the performance management system. It is important to ensure organizational effectiveness and track individual improvement and efficiency by cascading the institutional accountabilities to the various levels, units and individual personnel, as anchored on the establishment of a rational and factual basis for performance targets and measures. Finally, it is necessary to link the SPMS with other systems relating to human resources and to ensure adherence to the principle of performance-based tenure and incentives. 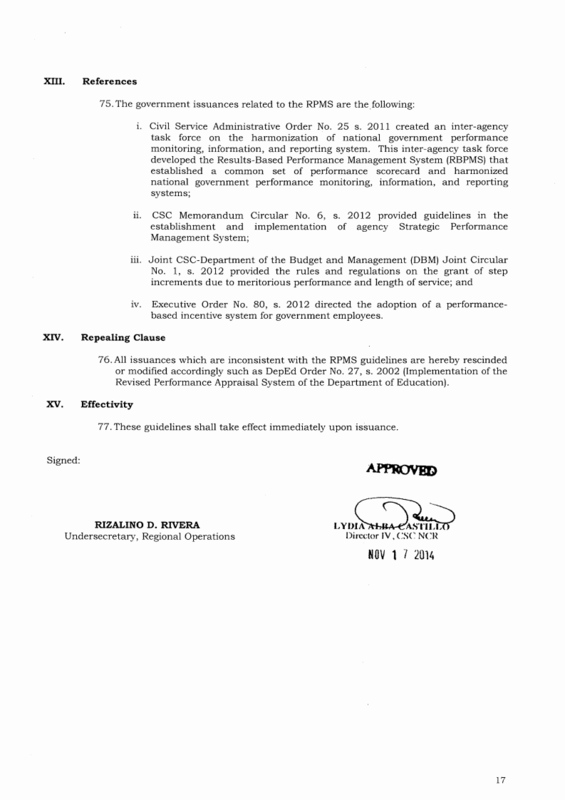 In view of the above, this Order aims to adopt the SPMS as the Results-based Performance Management System (RPMS). 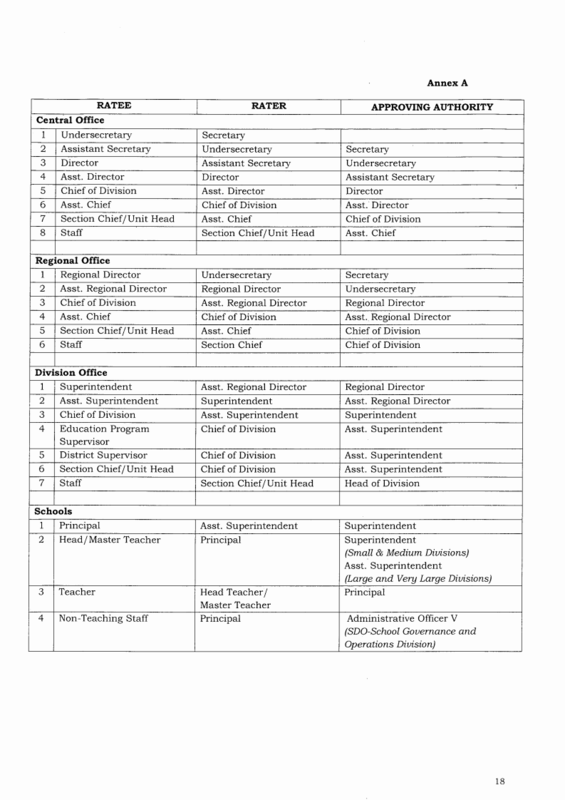 v. Non School-based Personnel include all regular/permanent, LGU-funded and contract of service/job detailed in rder personnel assigned and/or DepEd offices, from the central office to the schools division offices. 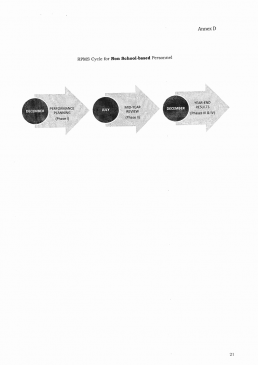 i. BHROD – Bureau of Human Resource and Organizational Development. The DepEd hereby sets the guidelines on the establishment and implementation of the Results-based Performance Management System. (RPMS) in the Department, stipulating the strategies, methods, tools and rewards for assessing the accomplishments vis-a-vis the commitments. This will be used for measuring and rewarding higher levels of performance of the various units and development planning of all personnel in all levels. 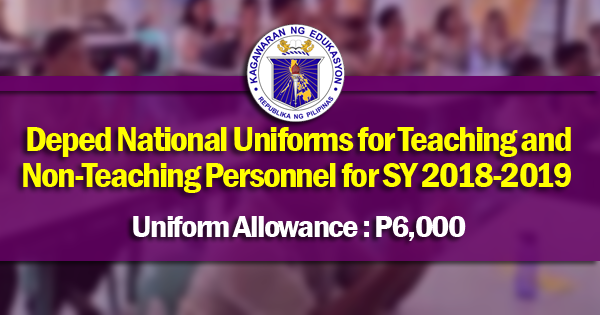 For non school-based personnel, the RPMS shall provide for an objective and verifiable basis for rating and ranking the performance of units and individual personnel in view of the granting of the Performance-Based Bonus (PBB) starting 2015. For school-based personnel, the RPMS shall be used only as an appraisal tool, which shall be the basis for training and development. The granting of PBB shall be governed by the existing PBB guidelines. 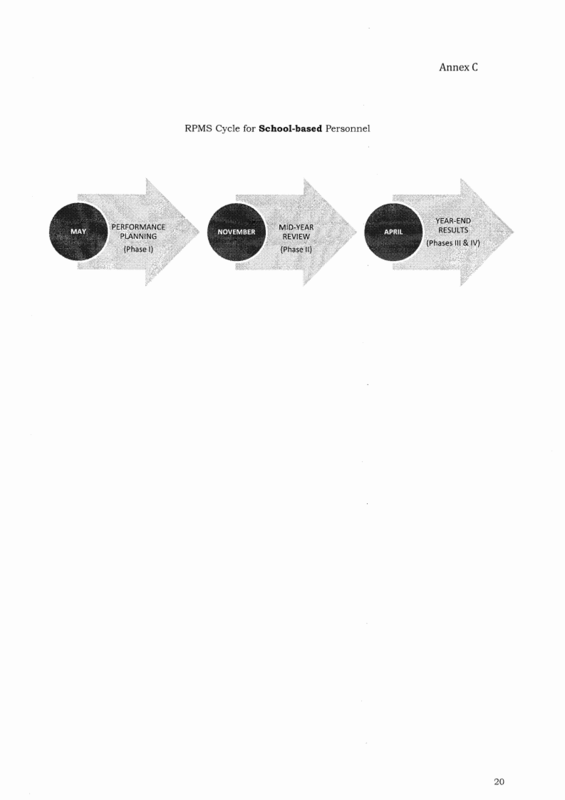 The Department shall adopt the RPMS framework shown in Annex B. The RPMS shall align the performance targets and accomplishments with the Department’s mandate, vision, mission and strategic goals. It shall ensure 100% results orientation vis-a-vis the planned targets. On the other hand, the ratee’s demonstration of the required competencies shall be monitored for developmental purposes only. The RPMS cycle shall cover performance for one whole year. 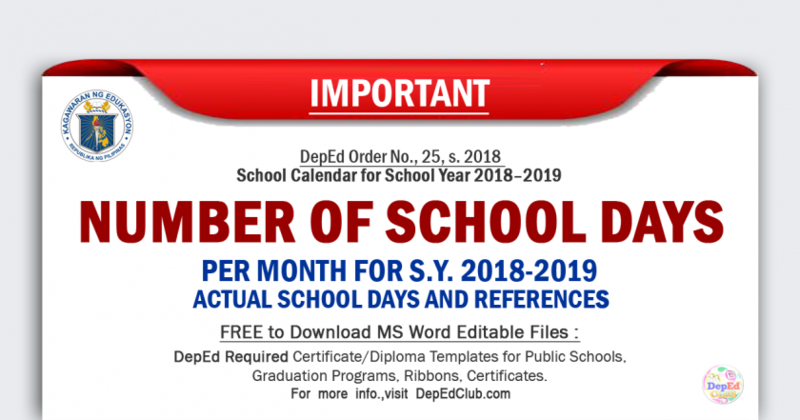 All school-based personnel shall follow a performance cycle starting in April of the current year and ending in March of the following year; while non school-based personnel shall follow a performance cycle starting in January and ending in December. Annexes C and D illustrate the performance cycles which shall apply to school-based and non school- based personnel, respectively. 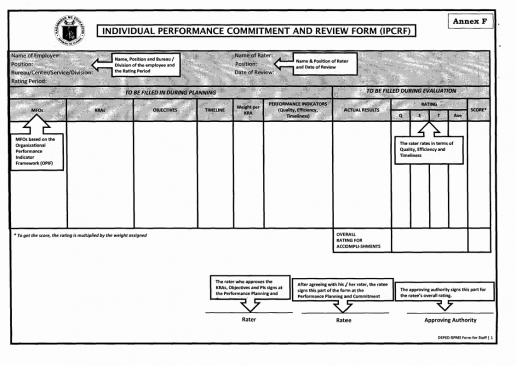 The performance planning and commitment shall be done prior to the beginning of the performance cycle; while the performance monitoring and coaching shall take place immediately after Phase I, and continue throughout the performance cycle. 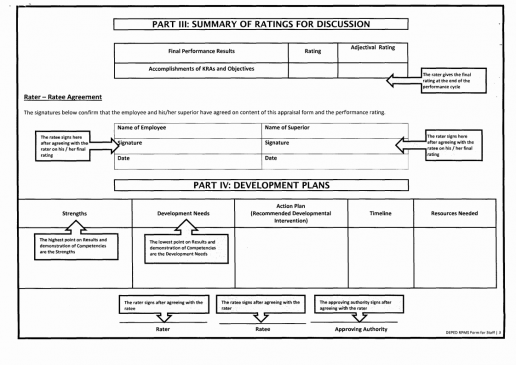 The performance review and evaluation, as well as the performance rewarding and development planning shall be done at the end of the performance cycle. 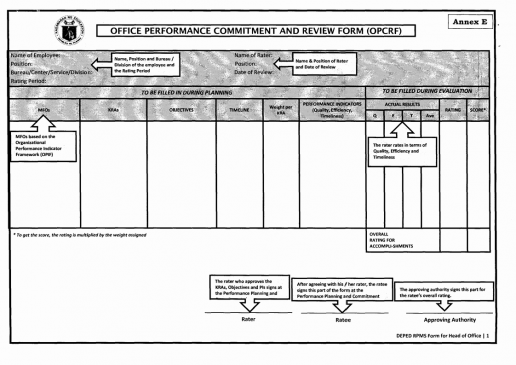 The Office Performance Commitment and Review Form (OPCRF) shall be accomplished by the head of office to reflect the Office KRAs, Objectives and Performance Indicators. The head of office, in coordination with the Planning Office, shall ensure alignment of the office plans and commitments to the overall organizational outcomes. The OPCRF shall be equivalent to the IPCRF of the head of office. 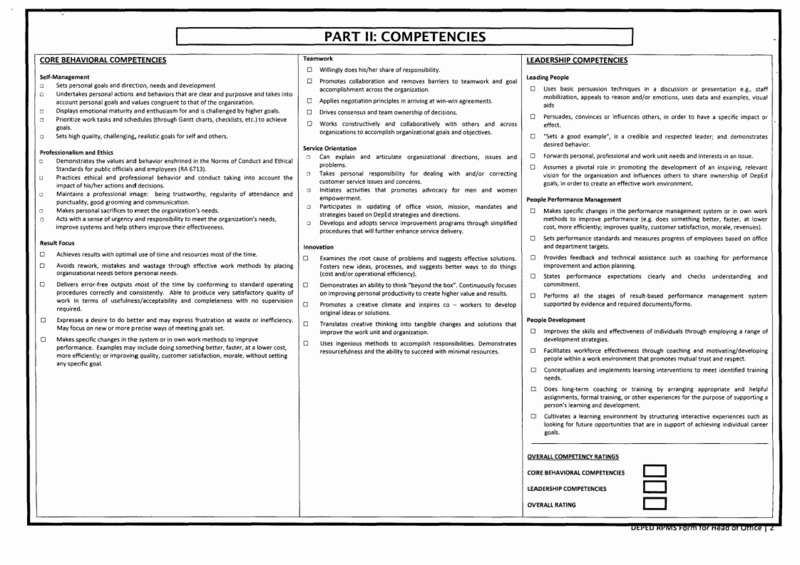 A sample of the filled out OPCRF, including the instructions for accomplishing the form, is shown in Annex E.
The Individual Performance Commitment and Review Form (IPCRF) shall be accomplished by the individual personnel to reflect the agreed Individual KRAs, Objectives and Performance Indicators. 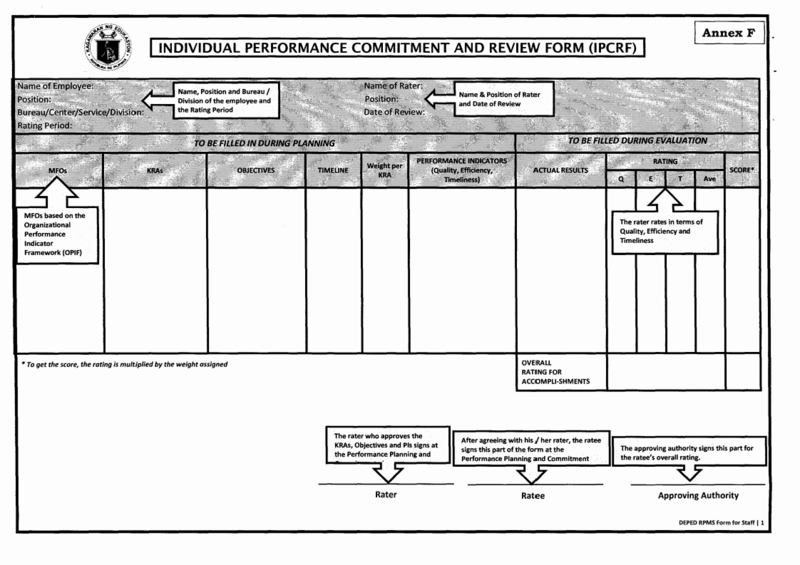 A sample of the filled out IPCRF, including the instructions for accomplishing the form, is shown in Annex F.
Defining the Key Result Areas. The head of office, in coordination with the Planning Office, shall define the office KRAs as anchored on the overall organizational outcomes. The rater and the ratee shall discuss and agree on the break down of the office KRAs into individual KRAs. Three (3) to five (5) KRAs shall be defined for each office and individual employee. KRAs are broad categories of general outputs or outcomes. It is the mandate or individual employee. The KRA is the reason why an function of the office and/or office and/or job exist. It is an area where the office and/or individual employee are expected to focus on. Setting the Objectives. The head of office shall set three (3) objectives per office KRA. The rater and the ratee shall discuss and agree on three (3) objectives per individual KRA. Setting the Timeline. The timeline shall define the target date for accomplishing each of the Objectives. 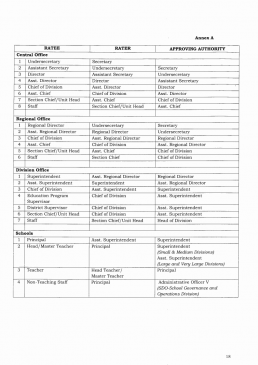 The timeline for the office Objectives shall be set by the head of office in coordination with the Planning Office and School Planning Team; while the timeline for the individual Objectives shall be discussed and agreed by the rater and the ratee. Assigning the Weight. Assigning of weights shall be done per KRA. Weights for each office KRA shall be assigned by the head of office in coordination with the Planning Office; while the weights for each of the individual KRAs shall be discussed and agreed upon by the rater and the ratee. Identifying the Performance Indicators. 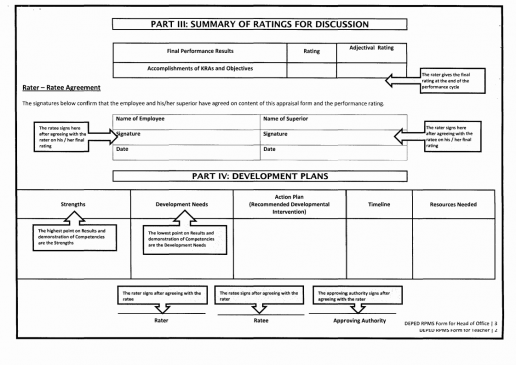 Using a five (5)-point rating scale, the head of office shall identify a performance indicator for each of the office objectives, while the rater and the ratee shall identify and agree on the performance indicator for each of the individual objectives. Demonstration of Competencies. 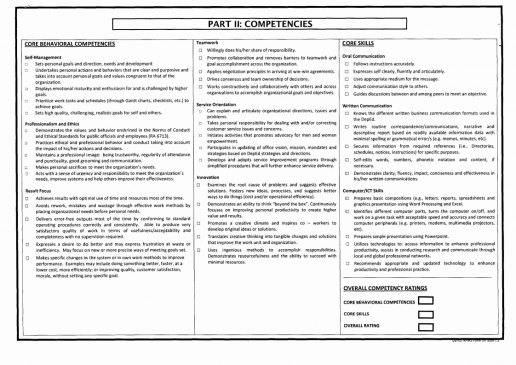 During Phase I, the rater shall discuss with the ratee the competencies required of the individual personnel. The ratee’s demonstration of the required competencies shall be monitored to effectively plan the interventions needed for behavioral and professional development. 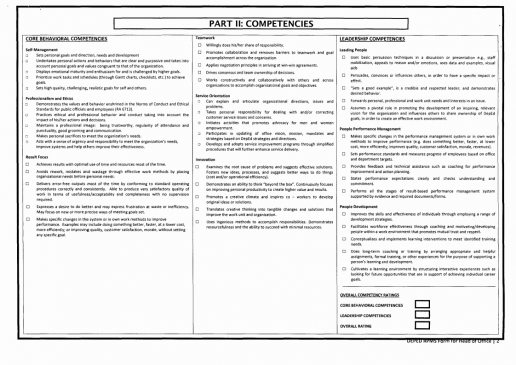 The assessment in the demonstration of competencies shall not be reflected in the final rating. Reaching Agreement. Once the office and individual KRAs, Objectives and Performance Indicators are clearly defined, the rater and the ratee shall commit and reach an agreement by signing the OPCRF and IPCRF. The signed/approved OPCRF and IPCRF shall be the basis for monitoring and assessment, which shall take place in Phases II and III, respectively. 31. Performance monitoring shall provide key inputs and objective basis for rating. 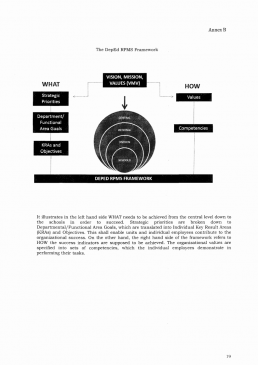 It facilitate feedback and provide evidence of performance. Initial self-rating shall be encouraged prior to the rater-ratee discussion. Third Level Officials, as heads of offices, shall accomplish the OPCRF for submission to the Planning Office. 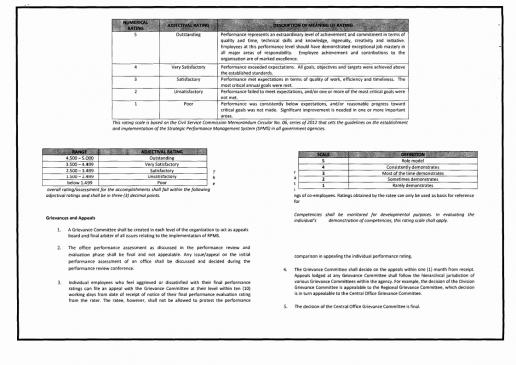 The individual assessment of Third Level Officials shall be contained in the CESPES Forms for submission to the Career Executive Service Board (CESB). The BHROD and Personnel Division shall be furnished a copy of both forms. Actual Results. The rater and the ratee shall discuss and agree on the actual accomplishments and results based on the performance commitments and measures made at the beginning of the rating period. They shall evaluate each objective whether it has been achieved or not. The significant incidents as reflected in the PMCF shall be considered for the actual results. 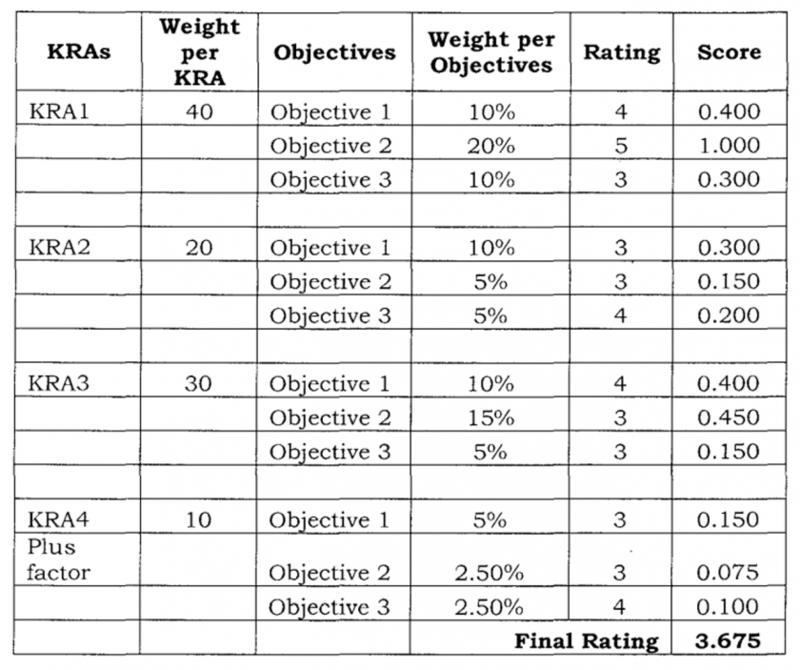 Process for Computing the Score per KRA. Plus Factor. The plus factor shall be considered as another KRA. These are value adding accomplishments, which are not covered within the regular duties and responsibilities. The weight on the plus factor shall not exceed the weight of the highest mandated KRA. The rater and the ratee shall identify and discuss the individual’s strengths and needs, and reflect them in the Part IV-Development Plans of the IPCRF. The competencies which the ratee demonstrated consistently and the areas, where the ratee meet or exceed expectations shall be referred to as the ratee’s strengths. The competencies, which the ratee rarely demonstrates and the areas where the ratee has room for improvement and has not met the expectations, shall be identified as the ratee’s development needs. For purposes of promotion and step increment, one (1) RPMS performance cycle shall be equivalent to two semestral rating periods. Employee development is a continuous learning process that enables the ratee to achieve his/her personal objectives within the context of the organizational goals. Employee development shall be a shared responsibility of the rater and the ratee, BHROD and the Organization. The summary of Development Plans Form shall be the basis for development planning. iv. PRAISE Committee in determining top performers of the agency who qualify for awards and incentives. The PMT at each level shall validate the Outstanding Performance Ratings and shall recommend employees for performance-based rewards. Grants of performance-based incentives shall be based on the final ratings of employees as approved by the head of office. For Central Office, final decision shall be with the Executive Committee (ExeCom). Performance ratings shall be used as basis for promotion, training and scholarship grants and other personnel actions. Employees with Outstanding and Very Satisfactory Performance Ratings shall be considered for the above-mentioned personnel actions and other related matters. 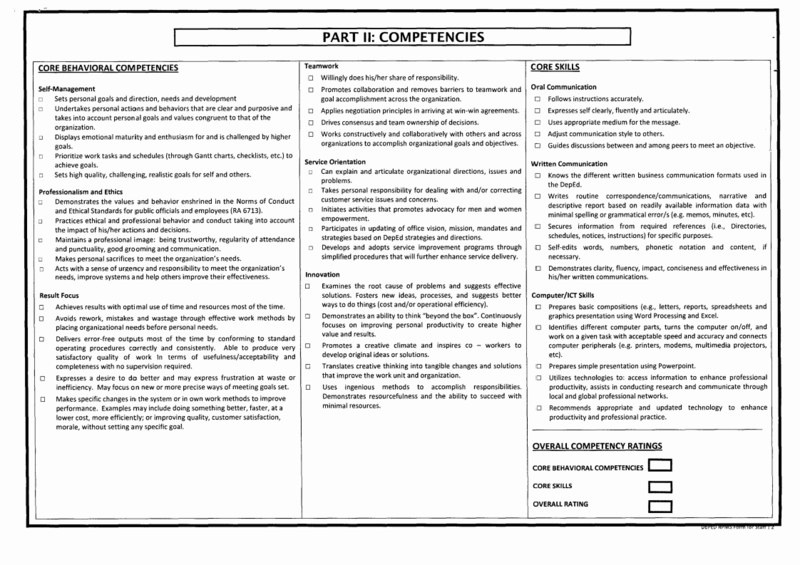 Employees and officials who obtained an Unsatisfactory or Poor Rating for one (1) rating period shall be provided with appropriate developmental intervention by the head of office and supervisor, in coordination with the BHROD/Personnel Division, to address competency-related performance gaps. Officials and employees who shall be on official travel, approved leave of absence, training or scholarship programs and who have already met the required minimum rating period of 90 days shall submit the performance commitment and rating report before they leave the office. For purposes of performance-based benefits, employees who are on official travel, scholarship or training within a rating period shall use their performance commitment and ratings obtained in the immediately preceding rating period. Employees who are on detail to another office shall be rated in their present or actual office, copy furnished their mother office. The ratings of those who were detailed or seconded to another office during the rating period shall be consolidated in the office, either the mother (plantilla) office or present office, where the employees have spent majority of their time during the rating period. Personnel on detail should submit a copy of their performance appraisal/rating from the office where they are on detail to DepEd. At the end of the performance cycle, file copy of accomplished and duly signed RPMS forms (OPCRF and IPCRF) shall be submitted by all offices to the Personnel Division at each level, which shall be attached to the individual personnel’s 201 file. i. Analysis of all OPCRF of the DepEd offices shall be submitted to the Planning Office at each level. Analysis of the OPCRF for schools shall be submitted to the School Effectiveness Division (SED). 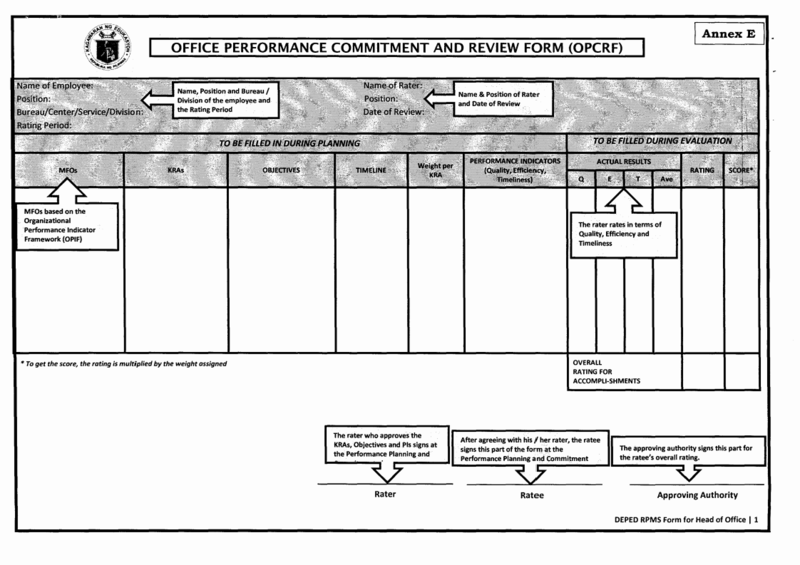 v. Assess performance of Offices. v. PMT adopts its own internal rules, procedures and strategies in carrying out the above responsibilities including schedule of meetings and deliberations and delegation of authority to representatives in case of absence of its members. iv. provide each Office with the final Office Assessment to serve as basis of offices in the assessment of individual staff members. iv. coordinate development interventions that will form part of the HR Plan. ix. provide preliminary rating to subordinates showing Poor performance not earlier than the third month of the rating period. A development plan shall be discussed with the concerned subordinate and issue a written notice than failure to improve their performance shall warrant administrative action. The Individual Employees shall act as partners of management and their co-employees in meeting organizational performance goals. 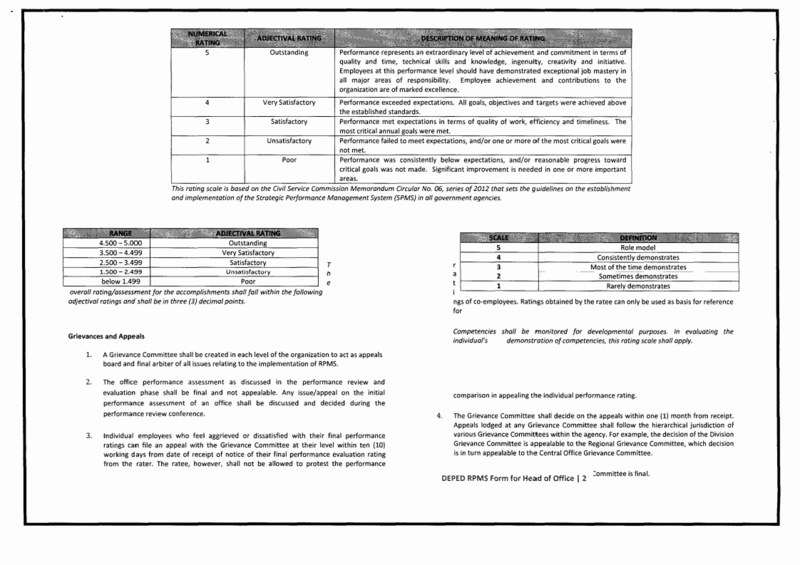 Unless justified and accepted by the PMT, non-submission of the OPCRF to the Planning Office and the IPCRF to the BHROD within the specified dates shall be ground for employee’s disqualification for performance-based personnel actions that require the rating for the given period such as promotion, training, scholarship grants, and PBB, if the failure of the submission of the said forms is due to the fault of the employee. 67. Any violation of reasonable office rules and regulations and simple neglect of duty for the supervisors or employees responsible for the delay or non-submission of the OPCRF and IPCRF shall be dealt with administratively. 68. Failure on the part of the head of office to comply with the required notices to their subordinates for their unsatisfactory or poor performance during a rating period shall be a ground for an administrative offense for neglect of duty. 69. A Grievance Committee shall be created in each level of the organization to act as appeals board on all issues relating to the implementation of RPMS. The composition of the Grievance Committee is detailed on Table 6 below. 70. The office performance assessment as discussed in the performance review and conference shall be final and not appealable. Any issue/appeal on the initial performance assessment of an Office shall be discussed and decided during the performance review conference. 71. Individual employees who feel aggrieved or dissatisfied with their final performance ratings can file an appeal with the PMT within ten (10) days from the date of receipt of notice of their final performance evaluation rating from the Head of Office. An office/unit or individual employee, however, shall not be allowed to protest the performance ratings of other office/unit or co-employees. Ratings obtained by other office/unit or employees can only be used as basis or reference for comparison in appealing one’s office or individual performance rating. 72. The PMT shall decide on the appeals within one month from receipt. Appeals lodged at any PMT shall follow the hierarchical jurisdiction of various PMTs in an agency. For example, the decision of the Provincial PMT is appealable to the Regional PMT which decision is in turn appealable to the National/Central Office PMT. 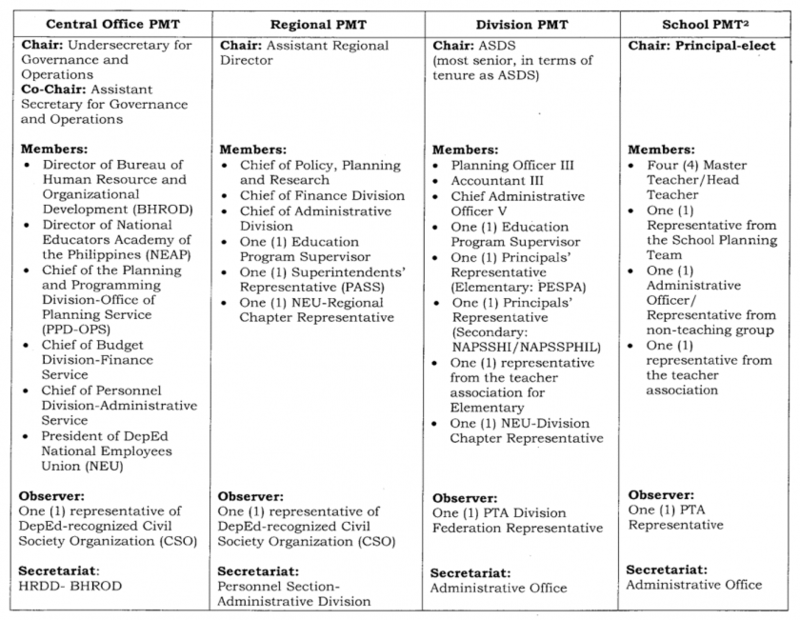 The decision of the PMT in the central office or departments may be appealed to the head of office. Officials or employees who are separated from the service on the basis of Unsatisfactory or Poor performance rating can appeal their separation to the CSC or at its regional office within 15 days from receipt of the order or notice of separation. Funds for training, and monitoring and evaluation related to RPMS including preparation of materials/forms shall be charged against the Human Resource Training and Development (HRTD) Funds. iv. Executive Order No. 80, s. 2012 directed the adoption of a performance-based incentive system for government employees. 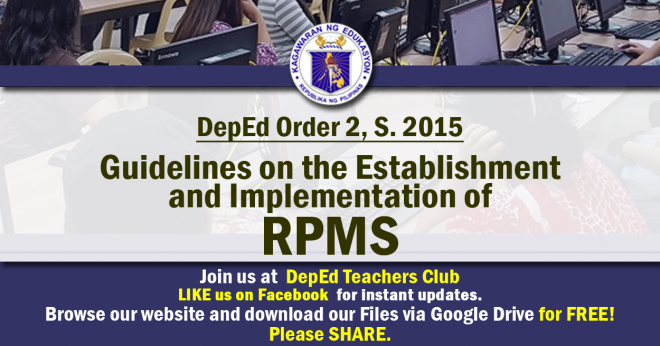 All issuances which are inconsistent with the RPMS guidelines are hereby rescinded or modified accordingly such as DepEd Order No. 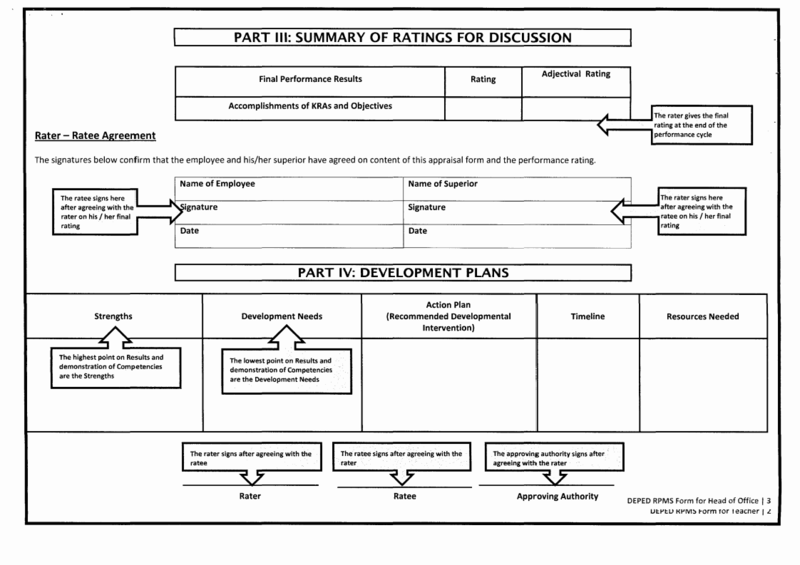 27, s. 2002 (Implementation of the Revised Performance Appraisal System of the Department of Education). 77. These guidelines shall take effect immediately upon issuance.